Earlier this year, Walmart rolled out free two-day shipping with no membership fee in an effort to compete with the Prime service offered by its rival Amazon. Shoppers looking to expedite the in-store shopping experience can skip the lines at Walmart altogether by using "express lanes," which require customers to scan their Walmart app, pay using Walmart Pay, and receive an electronic receipt. Shoppers using the store’s pharmacy may be able to obtain prescription refills more easily. Through the app, customers can quickly refill medications, track the status of their order, and view pricing and pickup details. “What our pharmacy business is likely most well-known for is our $4 prescription program that has saved our customers nearly $5 billion,” said Paul Beahm, senior vice president for Walmart Health and Wellness Operations. Now, he says, patients who use the pharmacy can save more than just money. The retailer has also made a few eco-friendly updates to its money services department. Instead of filling out paperwork in person, customers can enter their information securely in the Walmart app first. To complete a transaction, users can simply open the Walmart app, tap “money ready to send,” then enter a PIN or use Touch ID to activate a phone camera. Then, customers scan the code displayed at the register to verify information and make a payment. “These capabilities are the latest example of how we’re bringing together all of the conveniences of Walmart -- great stores, convenient pickup, easy checkout and a top-notch app -- to deliver one seamless shopping experience for customers,” said Daniel Eckert, senior vice president for Walmart Services. 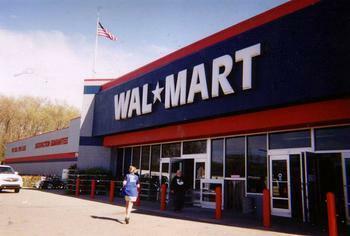 Walmart says its expanded services should be available in nearly all 4,700 stores by Fall.